St. Louis Robotics Integrator Achieves Highest Level of Certification. St. Louis, MO, April 03, 2019 --(PR.com)-- Productive Automated Systems Corporation, manufacturer of the PASCO® brand of robotic automation and palletizing machinery, announced today that it has achieved level 4, Certified Service Provider status with FANUC Robotics. 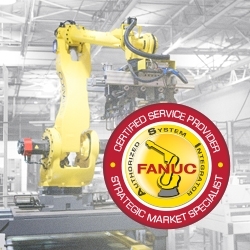 “As the global leader in advanced industrial robotics, FANUC has stringent requirements in place for its authorized integrators and the Certified Service Provider designation requires the most rigorous demonstration of knowledge, experience and skill of all their certification levels,” said Jim Nardulli, Vice President at Productive Automated Systems Corp. The Level 4 Service Provider certification is the highest level of certification possible from FANUC. Founded in 1976, Productive Automated Systems Corp is a respected innovator in the field of robotic automation and palletizing. The company integrates FANUC Robotics on an exclusive basis and offers systems that automate dirty, dangerous and demeaning tasks primarily in the packaging industry. About FANUC: FANUC America Corporation, headquartered in Rochester Hills, MI is the leading supplier of robots, CNC systems and factory automation. Founded in 1982, FANUC America has over 1,500 employees in the Americas. Our team of automation professionals work in customer service, engineering, finance, human resources, IT, logistics, operations, manufacturing, product development, sales & marketing and training.